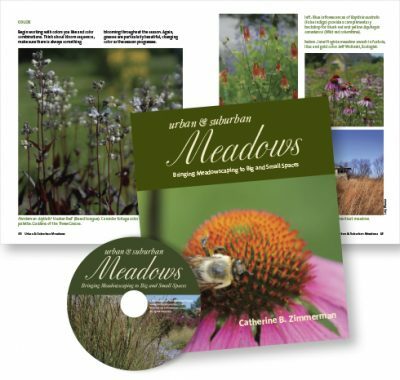 Newly revised, Urban & Suburban Meadows, a book and dvd by Catherine Zimmerman is back with a new forward by Heather Holm, more photos and awesome resources! With over 48 million acres of lawn in the U.S., Urban & Suburban Meadows exists to help people “just say No” to thirsty, pesticide ridden, energy consuming lawns. Author and photographer, Catherine Zimmerman combines her expertise in photography, storytelling, environmental issues, horticulture and organic practices to offer homeowners an ecologically significant and beautiful way to reduce the lawn. Zimmerman uses her own landscaping journey to create a guide that demonstrates both the need to change detrimental landscaping practices, and the practical know how and resources to accomplish that change. The film and book spotlight the exciting diversity of life that inhabits meadows and prairies, along with beautiful imagery to inspire meadow and prairie creation! The 60-minute video gives the viewer the option to watch it in one sitting, or click on individual chapters. Meadow experts Michael Nadeau, Larry Weaner and Neil Diboll, walk the viewer through meadow site preparation, design, planting and maintenance. In the chapter “Why Native Plants,” entomologist and author, Doug Tallamy, explains the intricate connection between native plants, native insects and the soil food web. You’ll get step-by-step instructions for meadow-making, plant lists, and a resource section with vendors, to help guide you through the process of bringing diversity back into your landscape. With the holidays right around the corner, you’ll want to order soon – Urban & Suburban Meadows makes a beautiful gift.